This summer’s CSA boxes have been very much like last summer’s boxes except we have gotten blueberries, like 2 pints, every week. Which is awesome. Blueberries are some of Bub’s favorites. If he gets to pick a pie, a turnover, waffles, pancakes, a strudel, ice cream or muffins- there is a really good chance it is going to be blueberry. The very first box with a pint a blueberries began Bub asking for blueberry turnovers. 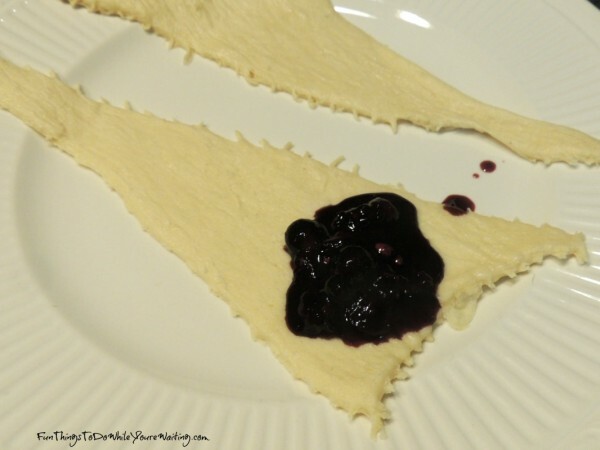 I have never made them, so I enlisted the help of my Momma who promptly told me she did not know how to cook blueberry turnovers… well, I was not convinced she was telling the truth because she can cook anything. But, she was certainly side-stepping. She tried to pacify him by making a blueberry cobbler. Dear Reader, when Bub sets his mind to something- there is no deterring him. Very rarely is he ugly about it or even overly pushy. There have been lots of times that he has waited patiently for me to cave come around to his way of thinking. But, at the end of the day- he gets what he set his mind to. It is totally up to me whether I want to fight him in the beginning or just go ahead and accept what he wants. Week 2 of the CSA box, 2 more pints of blueberries and here comes Bub wanting to know if I could make him some blueberry turnovers. 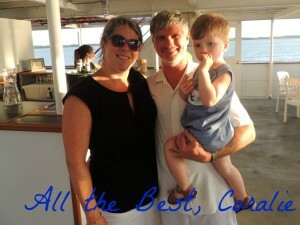 I reminded him of the blueberry cobbler that Momma had made- his short answer, it was good but not blueberry turnovers. 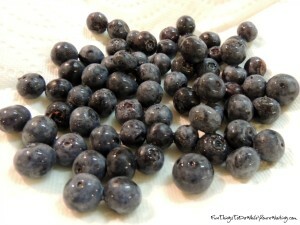 Well, I froze those blueberries super quick. And even though we continued to get blueberries weeks 3 and 4, it was not until week 5 that I decided to see if I could actually make Bub some blueberry turnovers. I decided I would wing it a little and cheat a little. I knew making the filling and making the icing would be pretty simple- it was the bread part that kind of perplexed me. 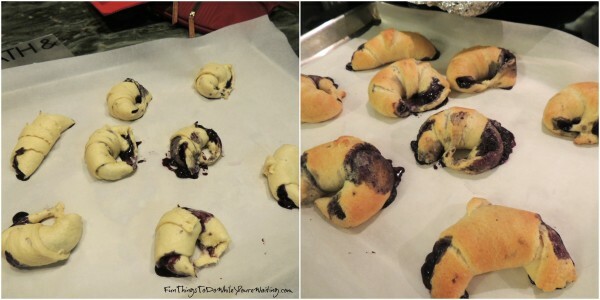 I did some research aka Google-ing and found something about making and using croissant dough… so, I cheated and just bought some Pillsbury canned crescent dough. 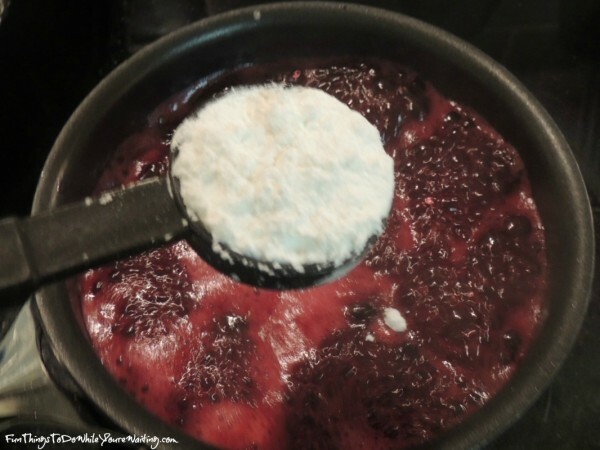 To make the filling, I put the blueberries in a small saucepan on medium-low heat with a little water and about an eighth of a cup of powdered sugar. I let this come to a boil and added 2 tablespoons of corn starch to thicken it up. 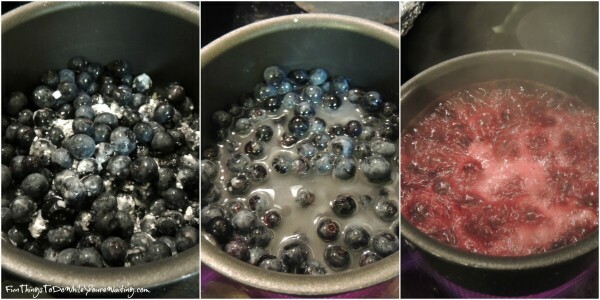 The corn starch goes a long way in thickening up the blueberries. If you would prefer the compote to be sweeter, add more sugar and vice versa. In the mean time, I got out my can of crescent rolls and unrolled them. I put a heaping tablespoon of the compote and on the big end of the triangle. I then rolled them up and then baked them according to the directions on the packaging. The filling leaked and I was not sure how they would turn out but in the end, it didn’t matter one bit. While the turnovers were baking, I whipped up some simple cream cheese icing. 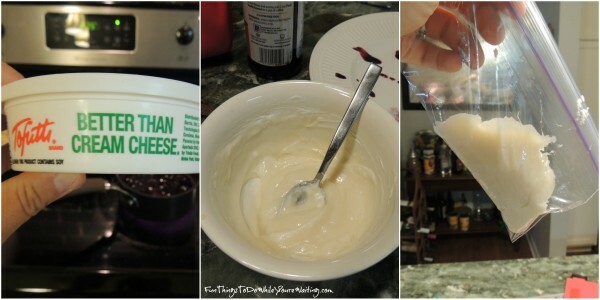 I used Tofuti Better Than Cream Cheese, powdered sugar and a dash of vanilla extract. When I got it mixed together, I put it in a snack size zip-lock bag and snipped the corner. I used the zip-lock like a pastry bag. And let me tell you, for shooting from the hip- these suckers turned out great! Sometimes you just gotta go for it! 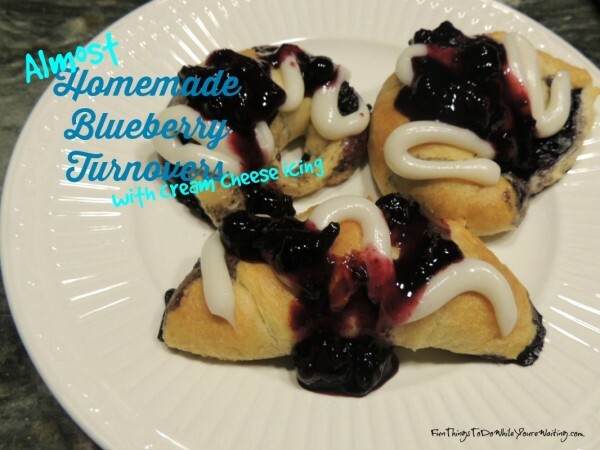 Bub was so persistent in wanting blueberry turnovers and let’s be honest- I like making him happy. Give these a whirl- they are tasty! 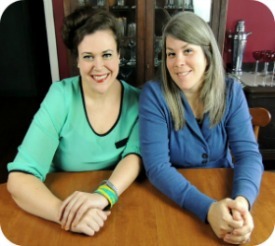 Do you have any recipes that you just came up with on the fly that turned out great? As always, let us hear about it.